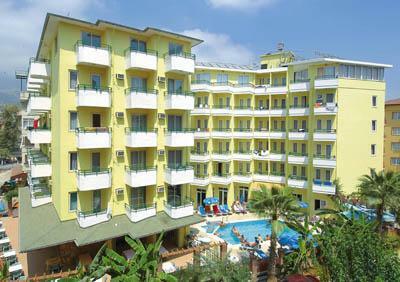 Situated 500m from the centre of Alanya, just 150m from the famous Cleopatra beach. Antalya airport is just 119 km away. Table tennis * fitness * darts. Tennis courts * tennis equipment * billiards * massage * sauna * Turkish bath * water sports. Air-conditioning (split) * balcony * satellite TV * bathroom with hairdryer * telephone * carpet * safe (payable locally). Located just 150m from the famous Cleopatra Beach. Sunbeds and umbrellas payable locally.